We received an email from a Howard University alumna looking to open a coffeeshop nearby. We pointed her to some of the following properties that appear to have retail space for rent and that are located along heavily trafficked corridors. First let’s look at the second floor of the recently renovated building (right) at Florida and Georgia Avenues. Earlier this summer Pharmacare opened up in one of the ground-floor retail spaces and we also learned that a 7-11 is slated for the rest of the ground floor. As far as we know, the second floor is still open and could serve as a sunny and spacious cafe location. 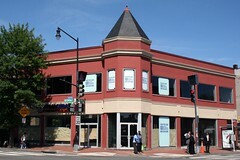 Sitting at a major crossroads, this building is well located to extend the U Street commercial corridor down along Florida Avenue. It also sits along a popular walking route for Howard students walking between campus and the Metro. At Sixth Street and Florida Avenue, by the LeDroit Park arch, are two empty retail spaces at the southwest and southeast corners. On the southeast corner is a two-story building (right) that is nearly finished its renovation. As we reported in September, the location along a heavily-trafficked corridor will benefit any business locating there. The renovated space sports new bay windows and benefits from ample outdoor sidewalk space for potential outdoor seating. Across the street at the southwest corner lies the remaining half of the old Pyramids restaurant. Last month Zee’s Restaurant opened up next door on Florida Avenue, but the eastern half is still open. Though it’s small, it also has ample sidewalk space along the Sixth Street face. 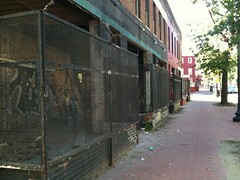 The last space we know about is the old hair salon at the corner of Fifth Street and Florida Avenue. 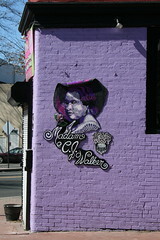 You may recognize it as the purple building adorned with the image of Madam C.J. Walker (right). The last time we checked, it was still for rent. Unfortunately it has little space for sidewalk seating, it’s isolated from other commercial strips, and it’s small. These are the properties we think would work well for a fledgling cafe. Are there any other locations nearby we missed? Also, what sort of amenities are you looking for in a neighborhood cafe? Both of the 6th and Florida locations would be great for a cafe! Hope this entrepreneur can make it happen! Would love to grab a cup to go on my way to the metro in the morning or spend a relaxing saturday there. My only advice would be to make the extra effort to become a unique destination – something that will not only attract the close neighbors which I think will be a given but somewhere people from outside the neighborhood would want to make the trek over to check out as well. 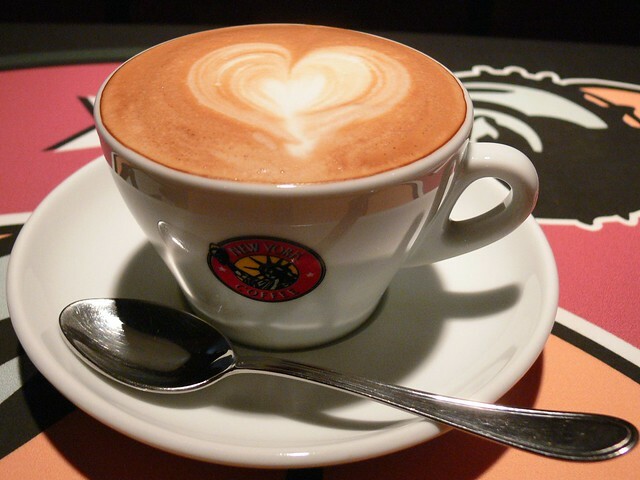 …it would focus on serving the best cup of coffee in town, above all else. …it would open early and stay open late (until 10 or 11). …it would always be busy without being overly crowded. …it would be a place where you could relax by yourself or meet with some friends. The interior layout would accommodate both. …it would be a place where the owner and the employees want to get to know you. …it would have worthwhile events, beyond the typical open mic night. I don’t know what the commercial rent is in Ledroit, but I’d hope that it’s a neighborhood with cost advantages that could allow a potential coffee shop to do things that places with higher overhead can’t do. If you’re going to do a cafe, you should do breakfast as well! We only have a couple places in the neighborhood, Florida Ave Grill and U Street Cafe that actually do breakfast earlier than the typical brunch and both a small and crowded. Generally, if you’re awake before 9am, you’re out of luck. Just a thought, but I think that a cafe with a business model similar to Panera would do AMAZING in this neighborhood!